This Friday, I’m attending a memorial service for one of the Navy SEALs who was on the helicopter downed in Afghanistan while rescuing Army Rangers. I met Special Operations Chief Brian Bill briefly back in April when he gave a presentation to the Navy SEAL RDAC, an organization that prepares candidates for the rigors of BUD/S training (and where I am the mentor for mental toughness). The SEALs and their special operations counterparts “conduct these missions night after night knowing that every mission could be their last,” said one of the Special Operations officer. Can you imagine living with such extreme intensity on a daily basis? It makes me think. How many of us are engaged in what entrepreneur mentor Pamela Slim calls “full-contact living”? Thanks to the instant gratification and 24/7 convenience of modern society, it’s a little too easy to fall into a comfortable-though-not-fulfilling groove, where we’re satisfied with the status quo but not really operating on all cylinders, living at full intensity. Some of you may be perfectly content to stay in your comfort zone, at least for now and, of course, that’s okay. For those of you, however, who are looking to kick it up a notch, you can sign up below for my free mental training course. I’ve been receiving your newsletters for awhile – ever since I signed up after being intrigued by your moniker – “flowjunkie.” Your issue today caught my eye for the mention of Navy SEALS. One of the most influential friends/people in my life became a Navy SEAL. I followed your tags and was stunned to see his photo in this post. 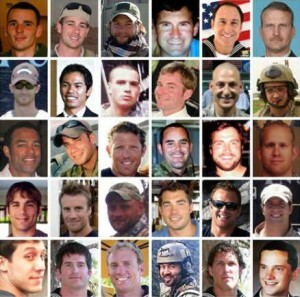 Jon Tumilson was killed in the same mission (bottom row second from left). He was the epitome of full-contact living his entire life and even more so after becoming a SEAL. He continues to inspire me to discover what that means in my own life. The serendipitous connection startled me a little today and I just wanted to make the connection and say thanks for your work. Leah, thanks for reaching out. We need Navy SEALs and others who demonstrate what full-contact living looks like.